Pegasus mythological flying horse born from drops of Medusa's blood as they fell into the sea. Carved in brick relief. 1.5m by 1.2m. 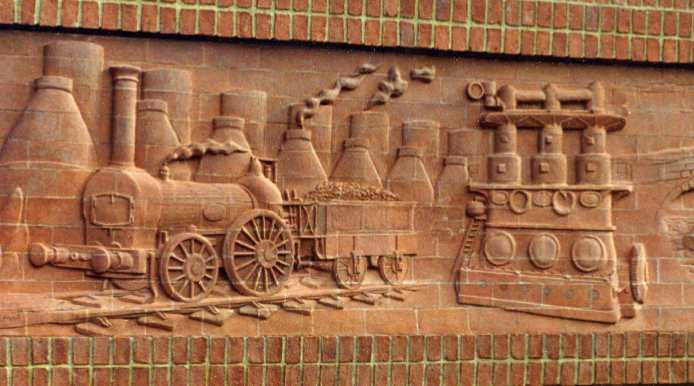 Rugby High Street brick relief mural depicting the historical industry of Rugby Town and surrounding area. 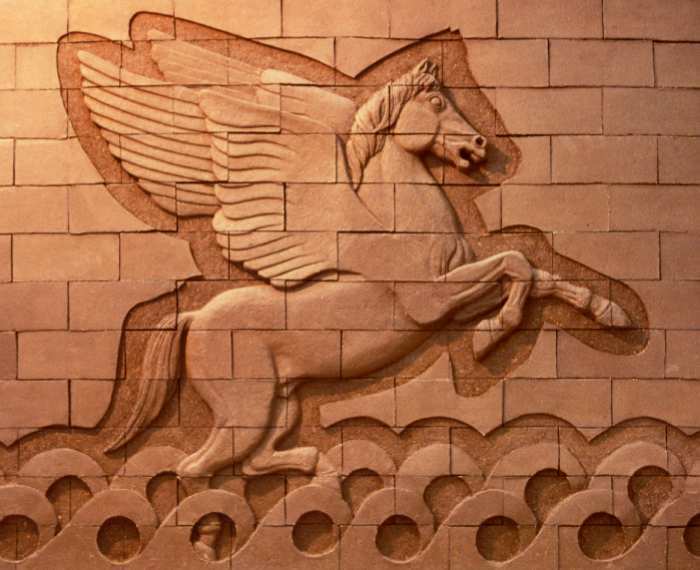 Pegasus above picturebrick sculpture relief using a manganese stained brick which fires a dark chocolate brown dependant on temperature, this decorative panel was purchased for a equestrian establishment and built into a wall on the premises. 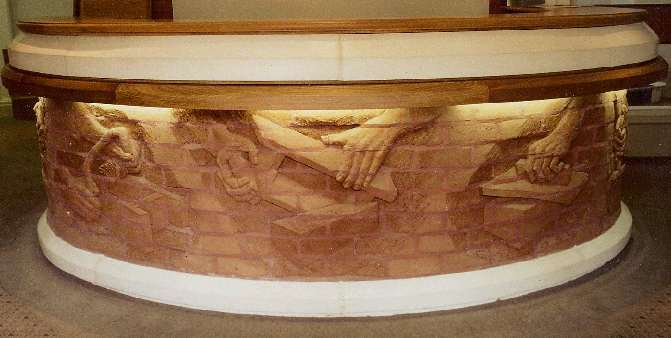 Below Rugby, brick relief sculpture panel 5m long by 1.3m high. This brick sculpture has been commissioned by Rugby Town Council, Warwickshire as part of their public arts policy. The photographs illustrate the brick sculpture at our studios in the clay state prior to being fired in the brick kilns. The sculpture measures 5m by 1.1m and will be in~situ by February year 2000. Art for Architecture were asked to design the sculpture scene and undertake the sculpture commission. 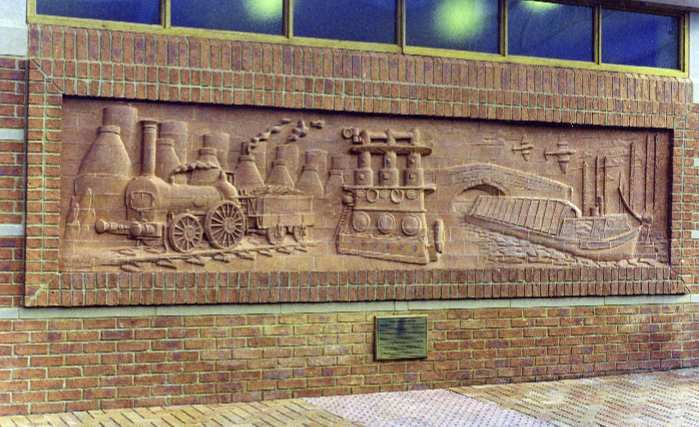 As we have extensive experience in brick sculpture we designed the work with great sculptural detail, to create a complex relief surface, a speciality of ours.The sculpture relief contains images of the industrial history of Rugby. Its cement works - RUGBY cement, are still based there today. The train refers to the railway history of the town where there was a locomotive testing station and several railway companies had stations there including the London - Birmingham and Midland counties railway companies. The strange looking machine in the middle of the artwork is a Willans steam turbine generator, built around the turn of the century.On the right hand side a canal boat and bridge no 9 are depicted, as the Oxford canal was built around the Town of Rugby in 1773. Soaring above are Gloster Meteor jets, the designer of the Jet engine, Frank Whittle made his first prototype jet engines at the British Thomson Houston factory at Rugby. In the distance are the radio masts, which can still be seen from the M1 motorway going south past Rugby. 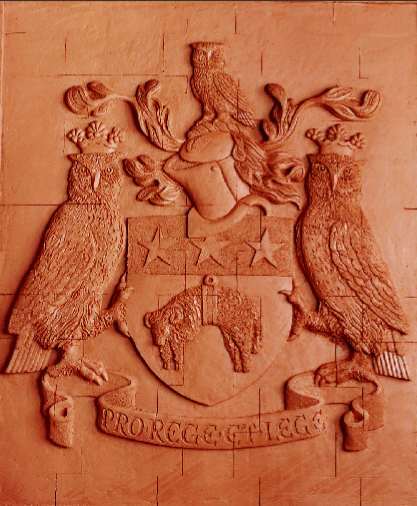 City of Leeds: civic coat of arms, commissioned by the city architects department for a public building in the Swarcliffe area of the city. 1.1m by 1m. Fired in red etruria marl brick clay to frost resistant temperature. semi circular desk feature depicting the sequence of events in hand brickmaking. Sited at a brick company head office foyer area. 5m diametre. Created by A4A's John McKenna using soft mud bricks. GemeiBelter Ziegelschreibtisch für brick plc, am regionalen Geschäftssitz.